(Reading, PA) - The Reading Fightin Phils, proud double-A affiliate of the Philadelphia Phillies, will be joining forces with MiLB Charities by donating 50/50 profits to the MiLB Hurricane Harvey relief fund rolled over from Monday, August 28th through Thursday, August 31st. Minor League Baseball Charities will match that amount up to $10,000. "The flooding and destruction related to Hurricane Harvey is epic", said Fightin Phils General Manager Scott Hunsicker. "Minor League Baseball has always been very generous, and Minor League Baseball teams, including the Fightins, have always stepped up in times of need. The Fightins are happy to contribute, in our own small way, to the relief fund for Hurricane Harvey. 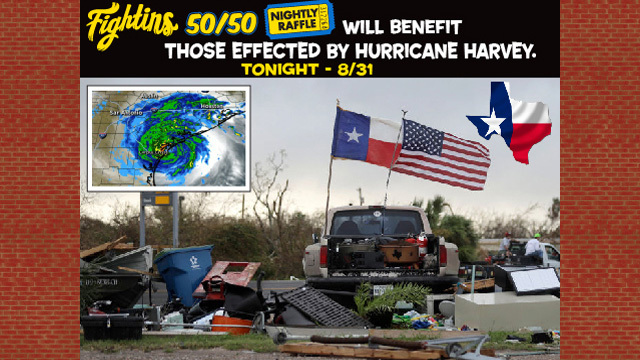 I know our fans will be happy to know that the 50/50 will be benefiting the people affected by this terrible storm." At each home game throughout the season, Baseballtown Charities holds a 50/50 raffle. One fan takes home 50 percent of each night's collection while the other 50 percent normally benefits Baseballtown Charities. For these four games, the 50/50 will benefit the MiLB Hurricane Harvey relief fund. The winner of the 50/50 will be announced on Thursday, August 31st after the conclusion of the Reading Fightin Phils game.